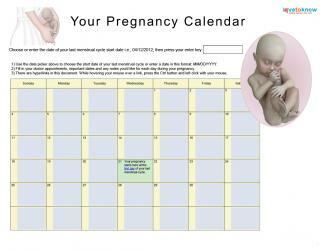 A lot is happening for both you and your little one during the 18th week of pregnancy. By making a few adjustments, you can minimize some of the pregnancy symptoms you're feeling and improve your energy level. Now that you're 18 weeks pregnant, your baby has an average crown-to-rump length of about five and a half inches. He probably weighs in about almost seven ounces. Your little one is constantly getting longer and filling out. In addition, the Mayo Clinic reports that your baby's hearing may be developing this week. His ears are properly shaped and may be beginning to pick up sounds. Right now, he will hear the sounds from inside your body, especially your heart beating. Outside sounds, especially loud or sharp noises, may also filter through your body and the amniotic fluid to reach your little one's ears. This is a great time to begin talking or reading to your child. During the 18th week of pregnancy, you're displaying a more obvious baby bump. Strangers will notice that you're pregnant, especially if you're wearing maternity clothes. You'll also notice some of the following changes. According to the American Pregnancy Association, many women experience feelings of dizziness during the 18th week. This is caused by postural hypotension, low blood pressure due to a change in position. It's a common pregnancy symptom since your cardiovascular system now reacts slower than before. To help avoid this dizziness, try to get up slowly when you are lying down. First, roll to your side and sit up. Then wait a moment before standing. This gives your body a chance to adjust to your change in position. By week 18, the March of Dimes reports that some women start to notice that their shoes feel tighter than normal. Pregnancy causes feet and other extreme ties to swell because of extra fluid retention. In fact, much of the weight you are gaining is in the form of extra fluid. The hormones that prepare your body for delivery can also cause your feet to spread by loosening up the joints. This problem usually disappears after the baby is born. However, you may need to purchase a slightly larger pair of shoes to wear for the remainder of your pregnancy. You can also help by elevating your feet as much as possible, staying cool, and limiting your salt intake. Exercise can also help. If you notice severe swelling, be sure to contact your doctor or midwife right away. This could indicate a dangerous condition called preeclampsia, which involves elevated blood pressure. According to WebMD, vision changes are another symptom that goes along with pregnancy. If you wear hard contact lenses, you may notice that they no longer seem to fit properly. Fluid retention can change the curvature of your eyes. Pregnancy hormones can also contribute to eye dryness and a decrease in tear production. If possible, you may want to consider switching to glasses or soft contacts for the remainder of your pregnancy. It's also a good idea to wait to get new glasses or contacts until after the baby has been born. In most women, the eye changes associated with pregnancy are temporary. During pregnancy, the joints in your pelvis begin to loosen up to allow for easier delivery of your baby. However, this can also cause back pain. Many women aggravate the problem by standing with their shoulders back and neck arched in an attempt to compensate for the extra weight of the baby. The best approach to dealing with back pain is prevention. Don't wear high heels and try not to stand for a long time. To carry groceries or other heavy packages, bend at the knees and lift with your arms and legs. Sit in a supportive chair whenever possible. Avoid crossing your legs, since this causes you to tilt your pelvis too far forward. Even if you're not bothered by back pain during the day, you may notice discomfort when you're trying to sleep. To get the rest you need, try sleeping on a firm mattress and using a maternity pillow to support your back. Since back pain is aggravated by stress, you may also wish to try a series of relaxing stretches and deep breathing exercises before bedtime. If you stay home, try to take a short nap when older kids are at school or are napping too. If you work, schedule a short nap right after you get home in the evening. Take a quick nap in your car at lunchtime, or close the door of your office for a short snooze. At your next prenatal visit, your doctor or midwife may talk to you about getting an ultrasound. Typically, these tests are performed around the 19th or 20th week of pregnancy, so you may get your first glimpse of your little one next week.